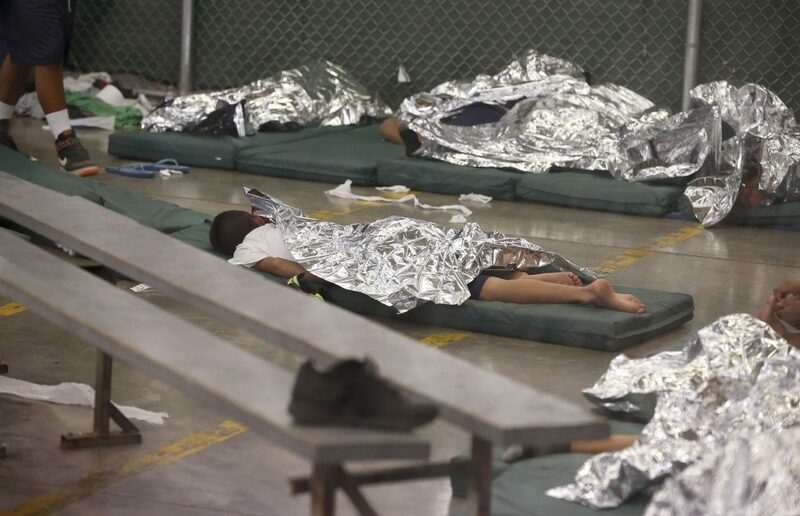 In this June 18, 2014, file photo, young boys sleep in a holding cell where hundreds of mostly Central American immigrant children are being processed and held at the U.S. Customs and Border Protection Nogales Placement Center in Nogales, Ariz. CPB provided media tours Wednesday of two locations in Brownsville and Nogales, Ariz. that have been central to processing the more than 47,000 unaccompanied children who have entered the country since Oct. 1. While the Trump Administration’s new zero tolerance policy continues to separate immigrant families in the Rio Grande Valley and elsewhere along the U.S.-Mexico border, the United Nations human rights office is urging the administration to “immediately halt” the policy, believing it to be in violation of children’s rights. The administration rejected the U.N. accusation and accused the organization’s human rights office of hypocrisy. The zero tolerance policy was implemented last month by U.S. Attorney General Jeff Sessions. The new policy prosecutes adults illegally crossing the U.S.-Mexico border and in doing so, separates any parents from their children. Not only is the policy a human rights violation, the U.N. and rights advocates argue, it also hasn’t deterred illegal immigration. There were 51,912 undocumented immigrants apprehended in May, the third month in a row the number has topped 50,000, according to numbers released by U.S. Customs and Border Protection on Wednesday. Of those apprehended in May, 6,405 were unaccompanied children. The new zero tolerance practice sends undocumented adults apprehended in the Valley to federal court in McAllen or Brownsville, where a magistrate judge issues sentences. “The U.S. should immediately halt this practice of separating families and stop criminalizing what should at most be an administrative offense — that of irregular entry or stay in the U.S.,” Shamdasani said. The U.S. ambassador to the U.N., Nikki Haley, responded in a statement. Clara Long, a senior researcher at Human Rights Watch, an international non-governmental organization, was baffled by Haley’s statement, especially as Long’s work focuses in part on the U.S.-Mexico border. The administration has portrayed its policy as being about illegal entry; however, many of the detained migrants enter at international bridges across the Valley to request asylum. Brian Griffey recently traveled the length of the border as a regional researcher and advisor with Amnesty International, also a non-governmental organization focused on human rights. During his trip from San Diego to Brownsville, Griffey said he met with fathers who were separated from their children. Griffey’s been working with a team tracking separation of families since November 2017, and from January to May they’ve followed 15 cases specifically. Of those, he said 13 presented themselves formally at a port of entry seeking asylum, which is not illegal. “That flies in the face of what we’re hearing from this administration for justification for separation,” Griffey said in an interview. Shamdasani argued similarly when talking to reporters in Geneva. The U.S. Department of Homeland Security defended the administration’s enforcement.